the most pleasant experience because of the staff and how they treat guests as if they are at their homes. they are very helpful and are ready to provide any advise or help . they go out of their way to help . 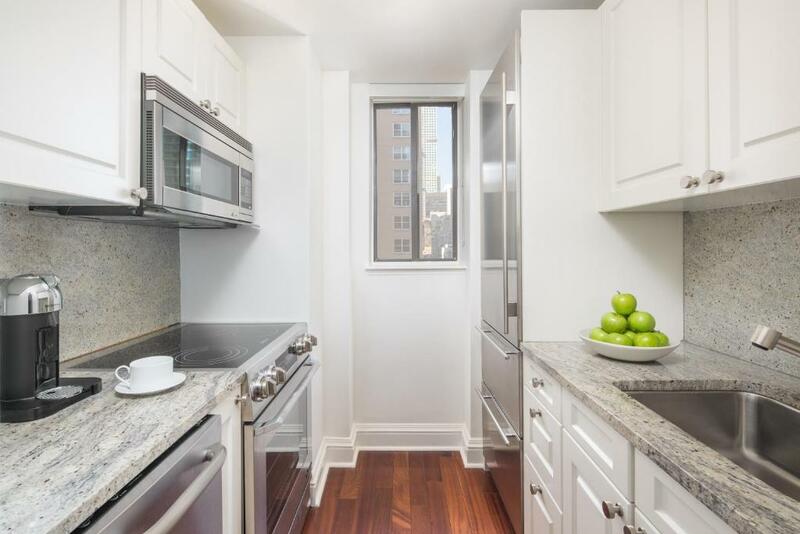 Beautifully appointed Traditional Apartment in a lovely area of New York City. Great Gym, Pool, Bar, Theatre and complimentary coffee provided. Good onsite Laundry available at no charge. Quiet street close to supermarket and Restaurants. The Reception staff were exceptional with a special mention to Spencer who was always very helpful. Clean, quiet and spacious accommodation. Well furnished and beds very comfy. 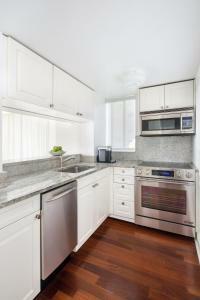 Walking distance of midtown and Central Park and 2 supermarkets within a block. Staff very helpful and pleasant. Not cheap but not much more than 2 hotel rooms and worth it for the space and comfort. Attentive personell. Style and general appearance of the apartment, size&comfort especially if you compare to rooms' size in hotels in central Manhattan. Very close to Wholefoods market if you need to buy some food etc. Quiet, very clean, full equipment, people at front desk, everything was perfect ! The location and the apartment was very comfortable. Also the staff were very friendly. On our last day we checked out at 11.00 a.m. but our flight wasn't until 10 o'clock at night. The hotel kindly allowed us to use the facilities until we took a taxi around 5.00 p.m. Thank you. The hotel is in construction so it is noisy from 9am to 5pm, but it doesn’t mention this before we booking. Also the mattress and pillows is very hard, I feel not comfortable with sleep condition. Btw, their staff are nice and helpful. We had a wonderful time! Very friendly and helpful personal. The pool and the cinema room were fantastic. Lock in a great price for AKA Sutton Place – rated 9.1 by recent guests! AKA Sutton Place This rating is a reflection of how the property compares to the industry standard when it comes to price, facilities and services available. It's based on a self-evaluation by the property. Use this rating to help choose your stay! 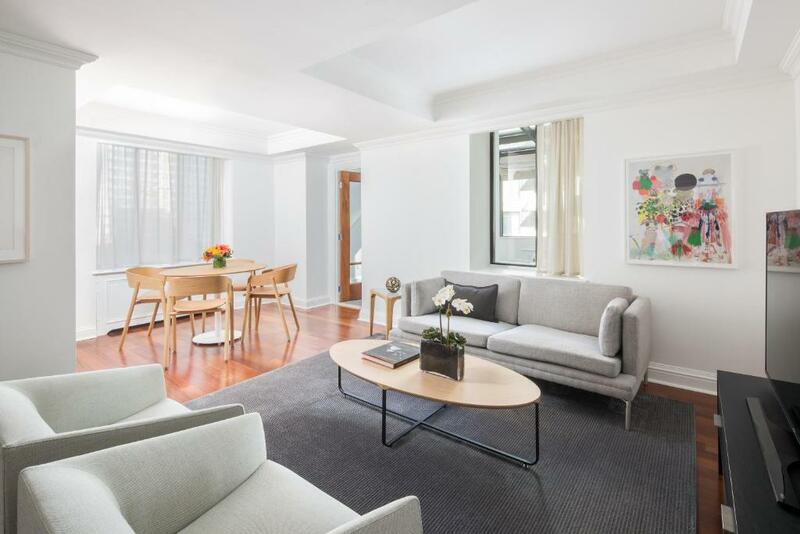 The AKA Sutton Place, located 0.8 mi from the Central Park, offers one and two bedroom apartments in New York City. Complimentary WiFi is offered. 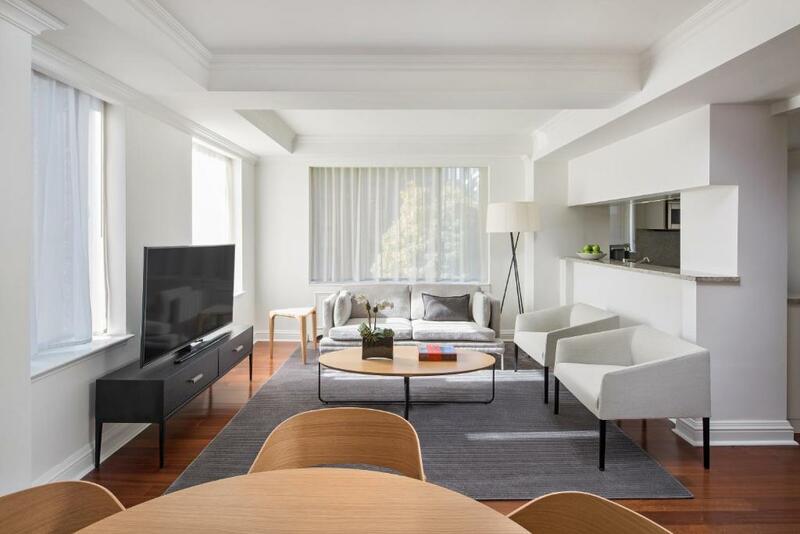 The apartments feature separate seating areas, kitchens and Bulgari bath amenities. The pre-war building has an indoor heated pool and a 24-hour fitness center. The property has a bar and lounge onsite and offers a business center with printing, copy and scan services. Bloomingdale's and Zara are within 0.6 mi of the property. Guests will find a subway station with 1,600 feet of the property. The United Nations Headquarters is less than 0.6 mi away. 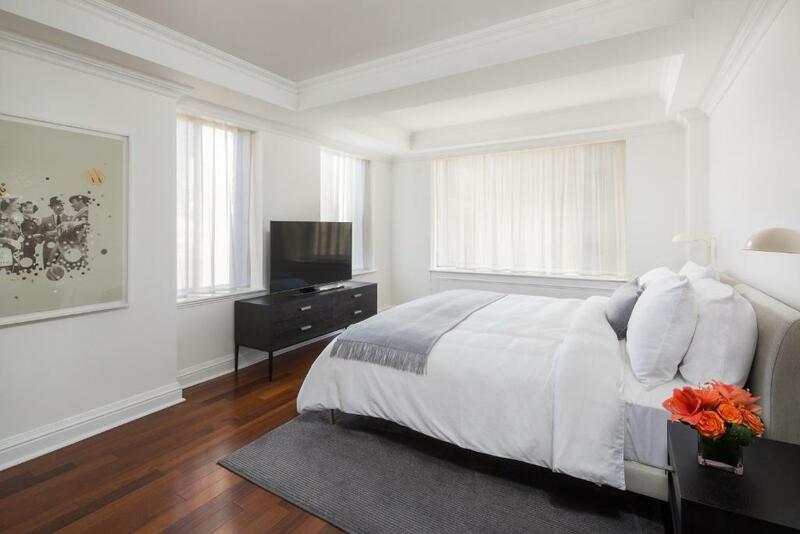 뀐 Located in the real heart of New York, this property has an excellent location score of 9.2! 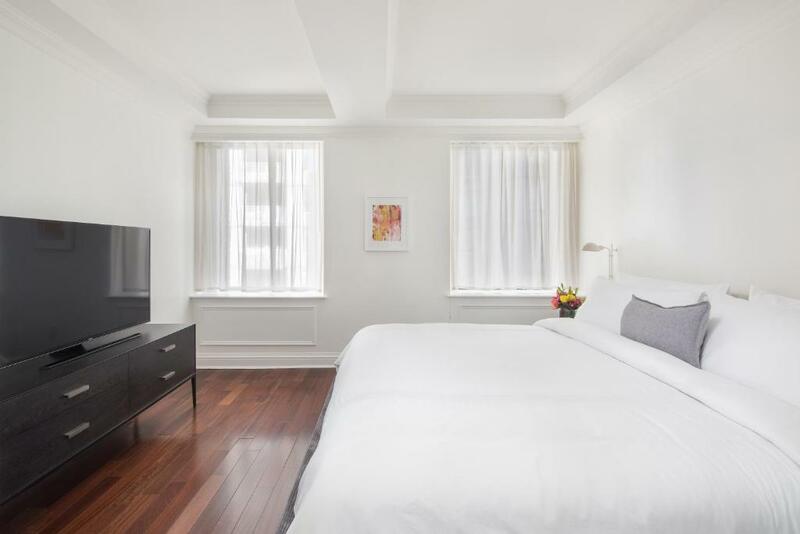 When would you like to stay at AKA Sutton Place? 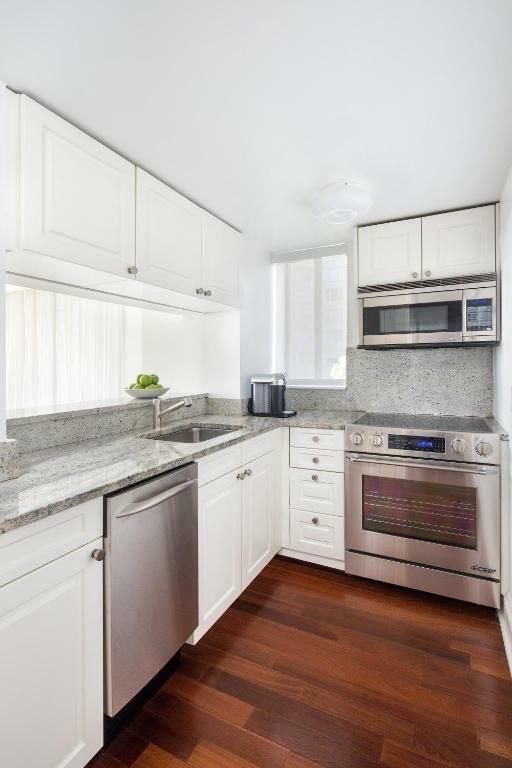 This apartment features a separate living area, dining area, and a full kitchen. This apartment features a separate living area and a full kitchen. This suite has a toaster, oven and seating area. This single room features a tumble dryer, washing machine and seating area. Nestled in one of Manhattan’s most exclusive neighborhoods, and just steps from midtown Manhattan’s best restaurants, shopping and cultural institutions, AKA Sutton Place balances the style and hospitality of an intimate hotel with the space and comfort of a fully appointed luxury residence. Ideal for short and long term stays, AKA Sutton Place features sophisticated one and two bedroom suites, all with gourmet kitchens and custom-designed furnishings, as well as elegant penthouses and spa-like baths with amenities from Bulgari. Superb amenities and services include a Resident Services Team, business center, private climate-controlled wine lockers, 55-foot heated indoor swimming pool, a Technogym fitness center, stylish private cinema, tranquil indoor garden, and a.lounge: a residents lounge. Area Info – This neighborhood is a great choice for travelers interested in food, restaurants and walking – Check location Excellent location – show map Guests loved walking around the neighborhood! House Rules AKA Sutton Place takes special requests – add in the next step! AKA Sutton Place accepts these cards and reserves the right to temporarily hold an amount prior to arrival. Cash is not accepted as payment at the hotel. Please note, the remaining amount of the reservation is due upon arrival. Housekeeping service is provided once per week for stays of 7 nights or more. Additional housekeeping services are available for a fee. Please note that the property's terms and conditions must be accepted to validate a reservation for over 28 nights. The management company will email a contract that requires a signature. Suites are fantastic and the staff are amazing. nothing much expect i would have liked to have a special treatment for those guests who are frequent and have been at Aka at several occasions.. i tried to extend my stay but there was no flexibility and the price was way higher than what i paid before.. The lighting in some areas of the complex was a little subdued. Time of checking out was at 11:00 am. And they force me out of the apartment without late check out, there was construction at the Place, no storage for luggage. They turned off the Wi-Fi at 11:00 am. We could have used a broom! I would have liked being informed that the property was a building site and that we couldn't open our blinds as workmen were walking right around the apartment. Being on the first floor meant that we heard a lot of noise from traffic at night and building work during the day. Scaffolding around hotel with men at window from 9am! Blocked what view we had and was a little off-putting. Swimming pool heating broken, though it is a beautiful pool. Fridge was also super noisy, sounded like a hoover was on. Staff great. Free coffee! Lounge area and apt were great. Location also spot on.